Sanders, D. & Gaston, K.J. 2018. How ecological communities respond to artificial light at night. Journal of Experimental Zoology Part A: Ecological and Integrative Physiology, in press [online early]. 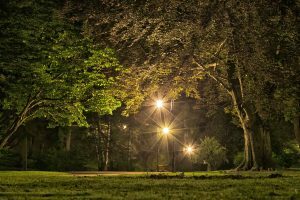 Many ecosystems worldwide are exposed to artificial light at night (ALAN), from streetlights and other sources, and a wide range of organisms has been shown to respond to this anthropogenic pressure. This raises concerns about the consequences for major ecosystem functions and their stability. However, there is limited understanding of how whole ecological communities respond to ALAN, and this cannot be gained simply by making predictions from observed single species physiological, behavioral, or ecological responses. Research needs to include an important building block of ecological communities, namely the interactions between species that drive ecological and evolutionary processes in ecosystems. Here, we summarize current knowledge about community responses to ALAN and illustrate different pathways and their impact on ecosystem functioning and stability. We discuss that documentation of the impact of ALAN on species interaction networks and trait distributions provides useful tools to link changes in community structure to ecosystem functions. Finally, we suggest several approaches to advance research that will link the diverse impact of ALAN to changes in ecosystems.